Yes, it is easy to install/flash and I am happy with the results. I also have a CSF Intercooler and oil cooler installed. Here is a video of a couple of laps at my local track Rudskogen. How do I get it to play directly here?? Last edited by Andreas21; 10-15-2018 at 09:06 AM. Cool black and white picture. Serious amazing build mate. The stealth effect tops it. I was planning for the Xpel Stealth wrap also. By the way, what type of finishing did you use for your raze aerokit ? Gloss or matte ? Did you consider the forged carbon at all ? You can never go wrong with revozport carbon fiber, they are extremely high quality. Great thread and build... looks like a 100k M2 by the looks of the specs!! Went to check that body kit at Revozsport and the link to the BMW section is dead??? It’s like they’ce stopped selling it? Sorry for the late reply, but I have replied via PM so you got answers to almost every question posted here. Forged carbon was not an option when I ordered this almost a year ago. The pieces have very high quality and I am happy I chose RevoZport. I have decided to do some minor upgrades before next season and I will go for AP Racing brakes on the rear and APEX SM-10 18x11 ET44 for the rear also. I am also looking at carbon doors to save more weight, but since this is a car I also drive on the road I will not fit a full cage so carbon doors is not a very good option I think. There is a chance I will check out bootmod3 also and see if I can get more power from that compared to what I get with ESS tuning, they also offer the GTS DCT mode that I am curious to check out on track. Last edited by Andreas21; 01-07-2019 at 12:31 PM. question, any idea what the max height drop is on the Ohlins? Sorry, I just use the default height and it is around 2cm lower than stock if I am not mistaken. It can be lovered more, but then it can be a problem on tracks like Nurburgring and I plan to drive there every season in the future. Love the CF trunk. Did you order it custom in the dry carbon? The Øhlins is better both on track and on the road. It is no longer bouncy and unsettled like with the original dampers. It is like that from RevoZport. Nice build! See you at the Nordschleife! I am concidering the big turbo upgrade by G-Power and might have it installed this year, but most likely next year due to the cost. I got an offer with Turbo, Software, downpipe, G-Power/Awron display, V-Max increase, GTS gearbox software and installation for 10000 Euros. Are there anyone in here with the G-Power turbo upgrade? Have you done a test fit with the 18x11 ET44? Or are you just just assuming they will fit based on the space you have with the 18x10? I'm looking at the same 18x11 wheel size myself, but wondering if camber adjustments will be enough to avoid rubbing. Maybe some fender rolling required? I know Apex offers the M2 specific 18x10.5 ET40, how hard could it be to fit 0.5" right? They offer the same in 19x11 ET44 for the M2 and I asked Apex if it would fit and they assured me it will. My car is in winter storage so I have not tested yet and I have not received the wheels yet either. The wheel will be 2mm closer to the fender compared to the 18x10 ET33 so I dont think it will be a problem. I will keep on posting pictures of the coming mods! G-Power will most likely come in April, I am also looking at Eventuri intake and engine cover. AP Racing brakes on the rear will come in April also. 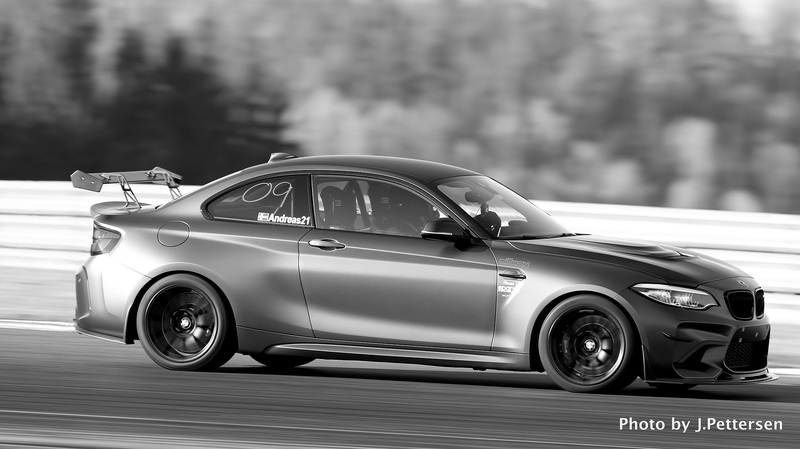 I will also most likely attend Skylimit Events trackday at the Nordschleife on April 29. Last edited by Andreas21; 02-13-2019 at 05:20 PM. Today I accepted the offer from G Power and I will go to Germany on April 25 to mount their turbo kit. And after the upgrade it is straight up to the Nordschleife to do some terroristfarten and a Skylimit Events trackday on April 29. Really looking forward to it! I have now fitted the 18x11 ET44 on the rear of the car with Pirelli Trofeo R 295/30-18 (305mm wide) and it fits perfect with no rubbing on normal street driving. This is with 2.5 negative camber. Nice to finally have the car out of storage and if everything goes well and the weather is fine I will do my first trackday of the year on April 8th or 14th.